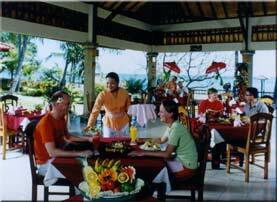 At the heart of Lovina beach, individual Balinese styled cottages and colorful flower ready to welcome you to Aditya Beach Cottages. 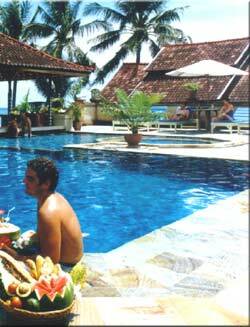 Only about six miles west of the historic small town Singaraja in the northern part of Bali. After giving yourself a treatment of sunbathing on the lustrous sandy beaches or dipping in the clear water sea you can enjoy relaxation in the fresh water swimming pool while enjoying a variety of of exotic drink from the sunken bar. Our 21 rooms Air-conditioned Cottages have private verandahs over looking the sea, private bathrooms with cold and hot water, completed with mini bar, color television and telephone. Colorful tropical flower garden embrace each of your individual paradise seclusion. 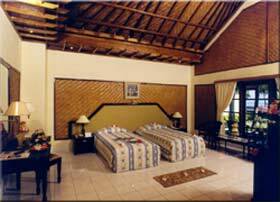 21 Rooms AC Standard Garden View have hot and cold water, color television and private verandahs. *) Internet Rates are nett, inclusive of government tax, service charge, breakfast. Published rates are subject to 21% government tax and service charge, inclusive of breakfast. 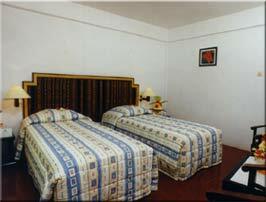 Two beach restaurants, swimming pool, sunken bar, sea water sport, free safety box, cafe sea view, laundry service, money changer, tour desk, postal service, doctor on call, parking lot, credit card accepted and telecommunication service. Daily sunrise dolphin tour is available at only Rp. 25.000 nett per person. Time 06:00 - 08:00 and the hotel also provide you with the facilities for snorkeling to enjoy the underwater tropical sea garden of beautiful tropical fishes. Fishing, sailing and scuba diving are the other facilities that you can enjoy from the hotel.